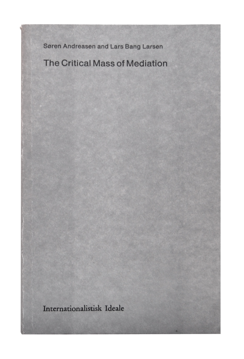 THE CRITICAL MASS OF MEDIATION: Publication by S¿ren Andreasen and Lars Bang Larsen. First edition published by Internationalistisk Ideale in 2012, second edition in 2015. The book discusses mediation as a condition of the cultural production of meaning and value. conducting for the past ten years in the form of articles, lectures and curating. The covers are printed in unique gradations of grey. The authors write: ÒToday mediation is a cultural given: an environment, a rhythm, a force. 2nd edition, 2015 – buy through Officin or Motto.